Cambria Quartz is one of the Hottest Countertop Materials available to the public right now. 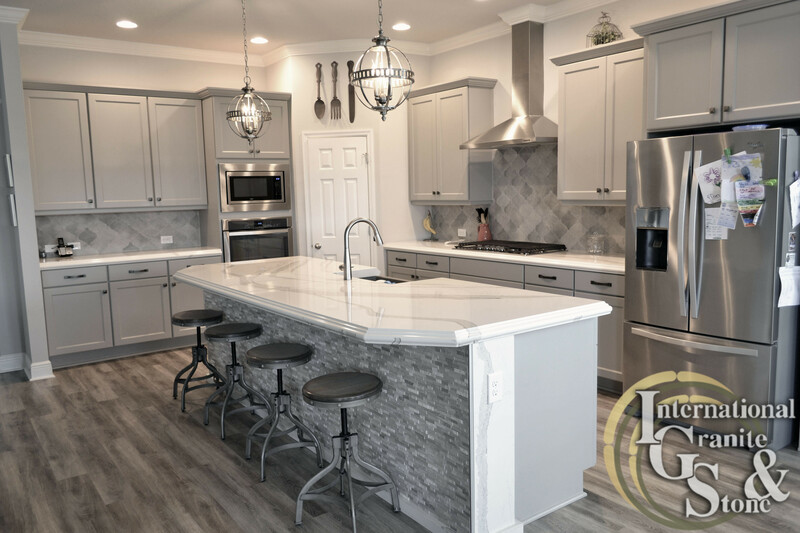 From New Home Builds to Flip Homes and Kitchen Rehab Projects, Homeowners everywhere are choosing Cambria Quartz for their Countertops in the Naples, Fl area over standard Granite tops. With its Durability and Shine, Quartz is all the rage right now. 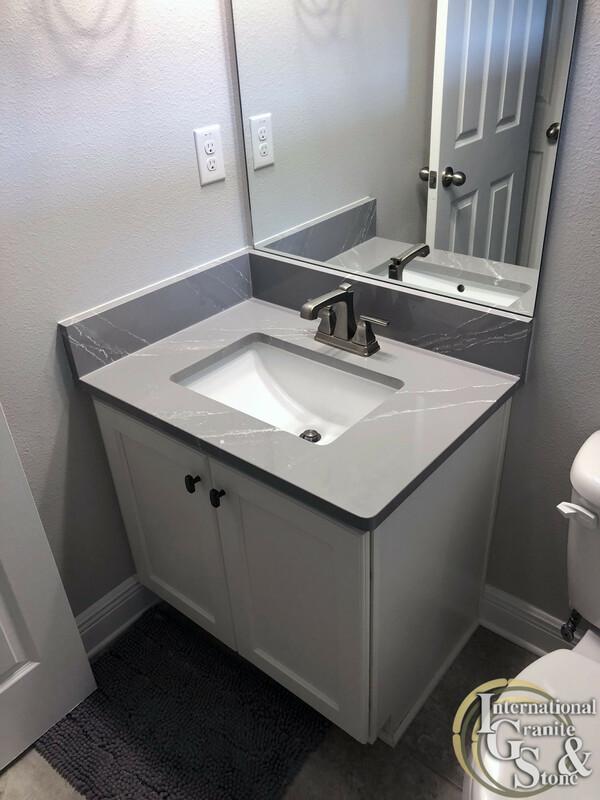 Another reason why most homeowners in the Naples area like quartz more than granite is because quartz never needs to be sealed, unlike Granite, Granite always needs to be Sealed to block out moisture and stains. 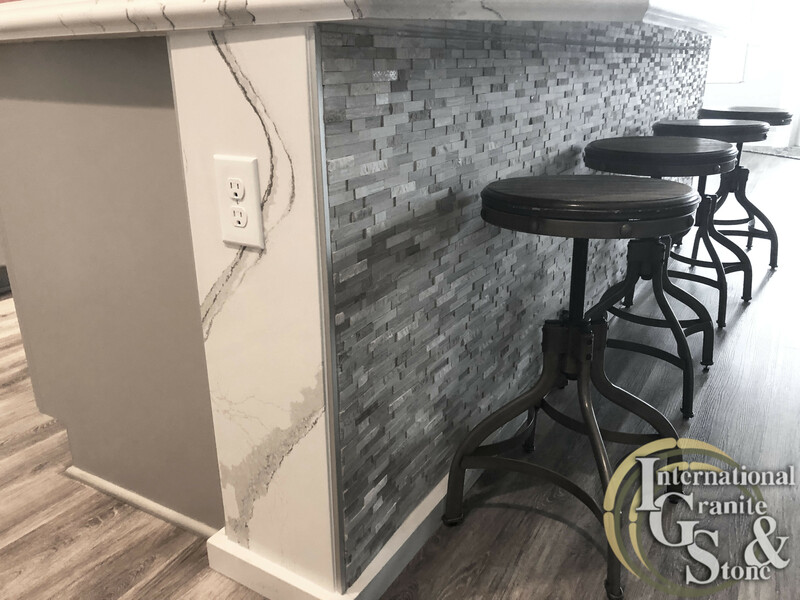 Read more for one of our Homeowner’s experience replacing Kitchen Countertops with International Granite and Stone, using Cambria Quartz. Florida natives Lorie and Chris Felle were in the process of building a new Home when they came to International Granite and Stone. 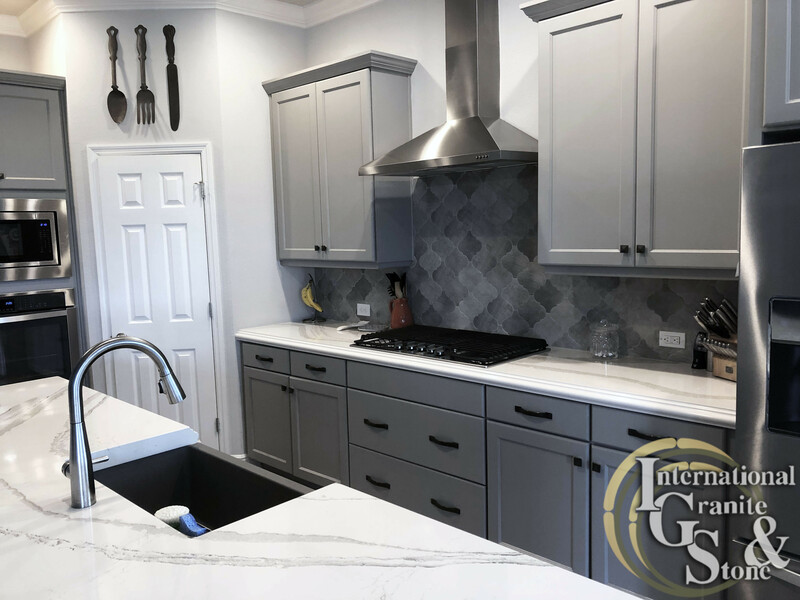 After doing their last Kitchen 11 years ago with IGS, they turned to the experts in fine surfaces again for help with all the surfaces in their new home. With this Kitchen, the Felle’s wanted to go with grays and whites. After deciding on an open concept Kitchen and Living Room Area, they built a Ten Foot Island to bridge the spaces. At the advice of IGS Design Rep Nate F., the Felle’s chose Cambria Britanicca Quartz, a white, wavy, marbled-looking Quartz Countertop. 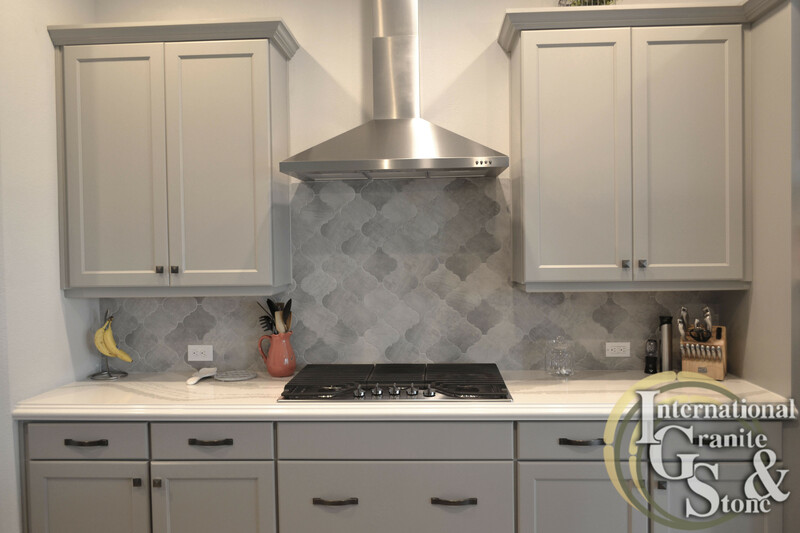 From there they discussed Backsplash Tile options, farmhouse sink options, and additional countertops in their master bathroom, and two other bathrooms. “I love the farmhouse apron sink style. It’s a nice big sink and we love the color” Mrs. Felle said of their Blanco Granite Composite Farmhouse Sink. 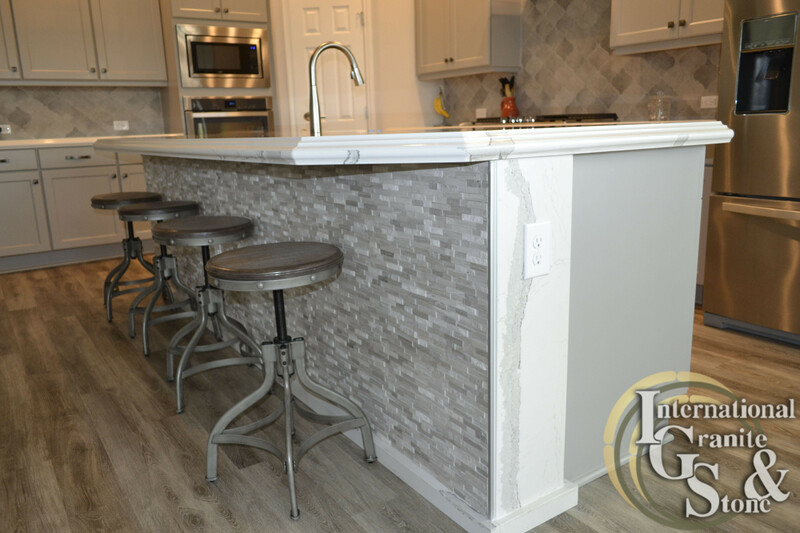 A Gray Slate Arabesque Tile was chosen for the Kitchen Backsplash. Cambria Quartz is also a great material for Bathroom Vanities, small and large. The great thing about new builds is that you need countertops for all the surfaces you’ve purchased cabinets for. Having this kind of control lets customers choose different designs perfect for each space. The Felle’s chose three different colors for their three Bathrooms. 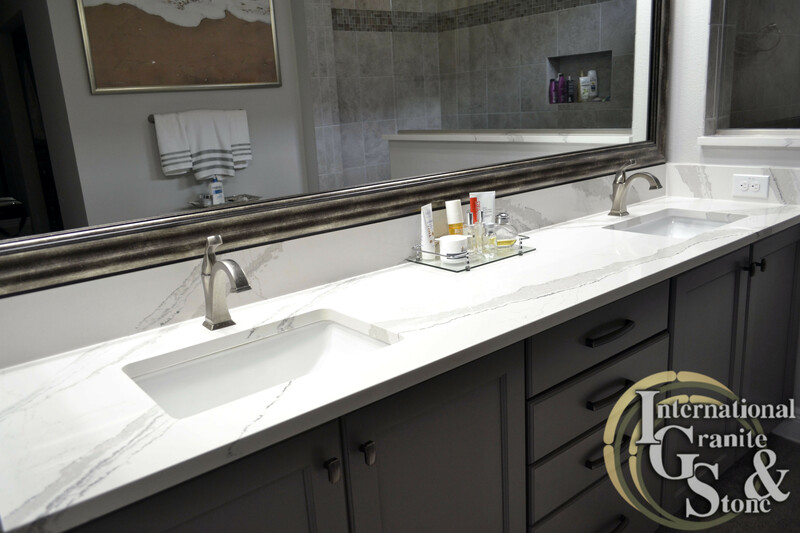 For the Master Bathroom, the Felle’s continued the Cambria Brittanicca from the Kitchen into their Ensuite. 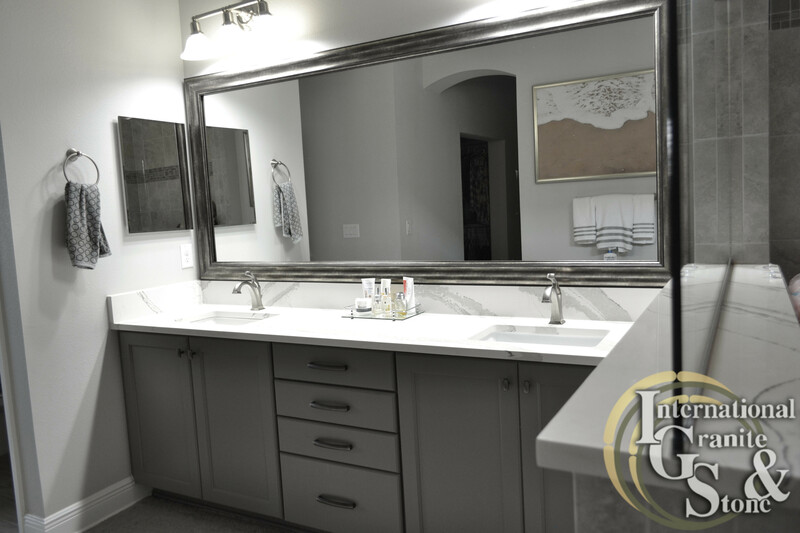 In their Children’s Bathroom, they decided to use the gorgeous Cambria Summerhill Quartz on the longer vanity. This color features vast gray veins that look best when laid out on a larger space. 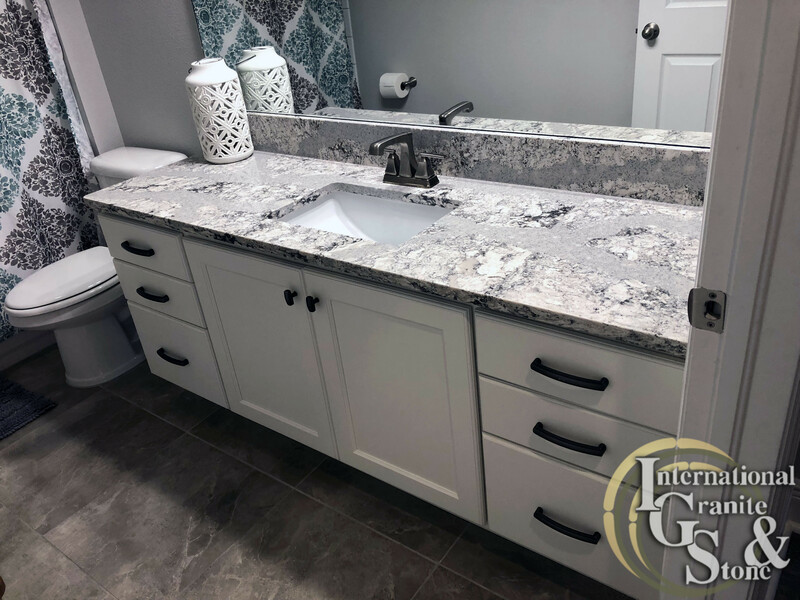 For the Hall Bathroom, IGS Design Representative Nate F. recommended Cambria Queen Anne Quartz, a gray marbled looking quartz with the same waving movement as Cambria Brittanicca Quartz. 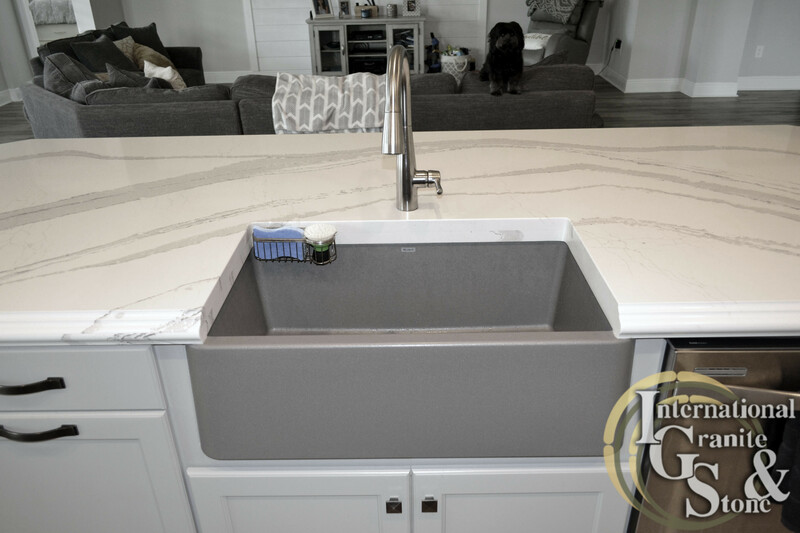 With an In-Home Appointment and Nate F.’s Help, the Felle’s Chose a Couple of Different Cambria Quartz Colors, known for Its Immense Durability and Low Maintenance. Overall, The Homeowner Used Cambria Brittanicca Quartz, Cambria Summerhill Quartz, and Cambria Queen Anne Quartz. Cambria Is an American Made Quartz Product Manufactured out Of Le Sueur, Minnesota. Lighter Colors Are Preferred to Customers. Cambria Quartz comes with a Lifetime Warranty from the Manufacturer. Buy with Confidence; Quartz Countertops are Stain Resistant and Scratch Resistant, and Never Require Sealer, Unlike Granite or Marble. Cambria Brittanicca and Queen Anne Are A Part of Cambria’s Marble Collection. Cambria Summerhill Is A Part Of Cambria’s Coastal Collection. At International Granite and Stone- Sarasota, We Make It Easy to Get New Kitchen or Bathroom Countertops. Shop Online, Schedule a Free In-Home Appointment or Visit our Cambria Quartz Premier Gallery of Sarasota, Featuring: Cambria Slabs, Kitchen and Bathroom Displays, Samples and More. 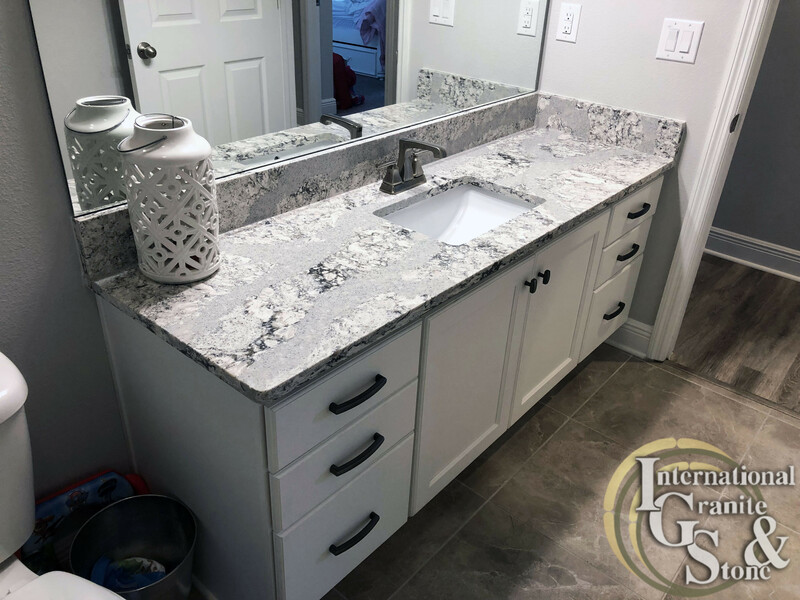 With over 17 years in the Countertop Industry, International Granite and Stone will get your job done right, guaranteed.